Hops around and rolls over, rears up on hind legs, and fights over a bone. This pet is received via an in-game mail sent to all characters (current and future) on all accounts tied to a Battle.net account that has been linked to a Blizzard Authenticator. If the authenticator is removed from a Battle.net account, the Core Hound Pup will disappear from the collection of all of characters associated with the account. If an authenticator is reattached, the pet will be re-mailed to all characters. If you switch authenticators while in-game, the pet will remain intact. Wildly flails at the enemy 1-2 times, dealing 197 Beast damage per hit. I just got mine today from Bizzard. So you can still get an Authenticator and get this really great pet. Just received a mail from Blizzard to activate the authenticator, and the pet is still available, in case someone is still wondering. Did not properly appreciate this little guy until I got his final ability. When I did, he became the heavy hitter of his team, able to 1 shot almost any wild pet opponent if I howled before a hit. His adorable resting animations are just a bonus. i need to reactivate my authenticator to get mine back. anyone got any team suggestions for this guy? This pet is directly attached to your authenticator, not your account, which means if you remove authenticator, Core Hound no longer will be available in game. It will became grey on your battle pets list and you won't be able to summon him even just as companion, until you re-activate the authenticator (mobile or keyring) or buy a new one. It will count for your captured pets though, despite the fact it is greyed and all his current stats and level will be preserved until you can reactivate him. This guy is an Elemental, so he has strong defense vs Mechanical abilities, and he also has Burn which is a powerful attack against mechanicals. Might be useful vs mechanicals hmm? I named mine AlmostFerocious. He's trying his best. I love this pet he packs quite a punch. He will be on my main team untill I find another that can woop him like a dog. I like the incentive for getting an authenticator. If you think about it, we really cared about getting the pet for our collection and now all our Blizzard games are more protected from hackers. It really is a great pet too. I use him a lot! I think its awesome that they decided to add this little one as a "reward" for getting the Authenticator. I'd like to correct a previous post and say that, yes, the Pup DOES interact with the fetch ball. I love playing fetch with my pup. You get this pet when you get an authenticator. It comes in the mail from Breanni. The core hound pup is very cute, and makes a good guard dog, he likes to stand on back legs, dig and fight over a bone, and i havent seen him do it but ive been told he rolls over. 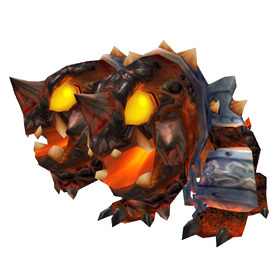 Since you only get this little guy if you have an Authenticator tied to your account, some guilds are using him as a security feature on the guild bank: people don't get access until they show their Corehound Pup pet. The Core Hound is most likely modelled after Cerberus - the mythical beast who guards the gates of hell. Although they've moved away from achievement pets for every 25 pets learned, it's nice to see Blizzard using pets as a carrot for things they want players to do. This pup is much better than Mr. Chilly (sorry, Chilly), who's pretty boring. This guy is as interesting as any pet in the game, and a definitely five-star one. I'm not a BM hunter, but anyone with a core hound pet needs to have this one out full time. Found in the Firelands and the Molten Core, core hounds can trace their lineage back to the alpha male, Magmadar.